I waited for Mr. Mortensen for nearly an hour since he was held up by the rain but it was a wonderful interview and a great and heartfelt presentation by his close friend Ed Harris. I found it very easy to feel comfortable with him because he did not present himself as a famous movie star but as a relaxed friend. What was particularly inspiring was his devotion to acting as a profession and way of life. 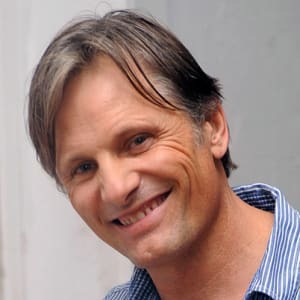 Viggo was careful to show that acting is a craft and not just a platform for stardom, which I believed was not important to him at all. My guess is that he chose the Lord of the Rings trilogy partly in order to make money in order to finance his many artistic ventures, since he is very creative from his music and poetry which he mentors other young creative artists. In any event, he obviously is a very professional actor who finds it important to get along with all people on the set and to appreciate his presence as a part of the artistic whole. He is also a great story teller. During the Lord of the Rings shoot, he told us the story of a sword expert, Bob Anderson, who happens to be disabled but nonetheless, was able to beat a strong stunt man with one or two finger which simply flicked the sword. What was very fascinating was his philosophy of acting since he found the ordinary drama in watching people’s reactions to events in life. He noticed that some people react strongly and others with dignity and realized the value of drama in everyday life. He was simply a dedicated artist and you could see it plain as day. Well said! This was the only one of the tributes I enjoyed the most because you can tell that he was just following his passion and speaking from his heart. Bitter sweet moment was when Ed Harris delivered the award to him. He’s a great actor. Very nicely put, I had rather a similar experience in that I found him to be more than just a man on the screen but through his tribute he became more like a close friend giving wonderful advice. Thanks for writing about the Viggo Mortensen tribute! It’s great to hear that you enjoyed this event and that Viggo is such a down to earth actor. It’s actually very refreshing to hear about an actor who focuses on other creative outlet’s; such as music and poetry! Wish I could’ve attended this event!